One month, 17 events in a collection of talks, TV appearances, radio programmes, debates and discussions, and appearances across the country from Cardiff to Birmingham, and of course, Bristol. 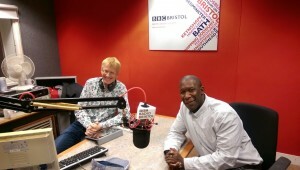 Roger hosted his weekly radio show, The Old Skool Cruising Show which had sponsorship for the first time from one of Bristol’s major family exhibits, the Science and Technology Centre of At Bristol https://www.at-bristol.org.uk/ His media and community consultancy, 2morrow 2day produced four special programmes for them as well as Bristol’s Big Conversation interviewing leading local community figures. These included Peaches Golding OBE, Bristol Bus Boycott campaigner Roy Hackett, former BBC Managing Editor Tim Pemberton and Gladiator champion Janet Teape (formerly Janet Allen) who now lives in America. 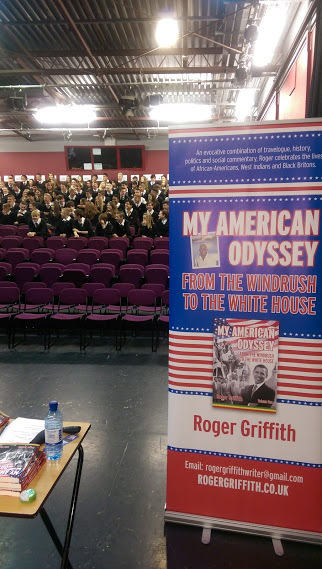 Roger delivered a big-screen presentation to 100 students aged between 13-15 years, at the auditorium in Hanham Wood Academy in Bristol. He was impressed by the challenging questions from some enquiring young minds. 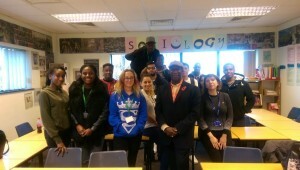 Roger gave a very personal talk to college students at South Gloucestershire College about his life without formal education in Bristol. He discussed finding his path to education through his heroes Malcolm X and Dr Martin Luther King and the need for continuous personal development. Roger gave his first ever lecture to university students. He said ‘For a boy who left school without any qualifications and never visited a university until he was in his twenties it was very humbling’. 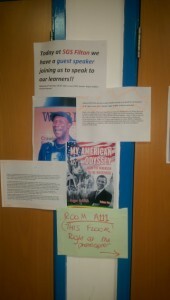 He was invited by Dr Sarah Robertson to present to her history students. Following his lecture he is now an Associate Lecturer for UWE and works with UWE’s widening participation team to recruit new students for the University. Roger appeared on Made in Bristol TV in a feature for the book and also was a guest reviewer on Ellie Pitt’s Press Pitt. He appeared as a radio guest on Dinner with Phil Hammond on Radio Bristol and also Radio West Midlands co-inciding with his appearance at The Drum in Birmingham. 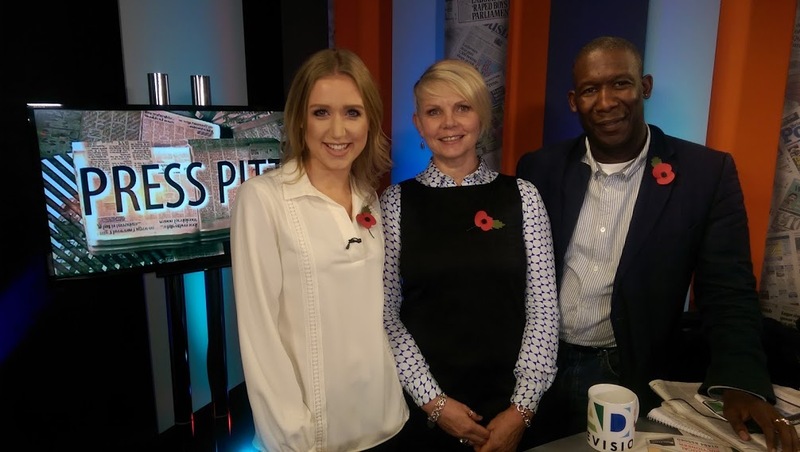 Made in Bristol TV Press Pitt. Ellie Pitt and Jane Evans. Roger, as an ardent supporter of Black History Month, sees this as a way of sharing stories and bringing people together. 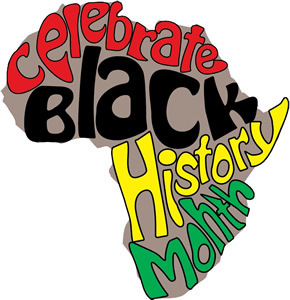 Black History Month provides a great opportunity to showcase history through arts and culture, and celebrate heritage of giants. He attended and took part in a Live Lab Radio and went to… radio event. 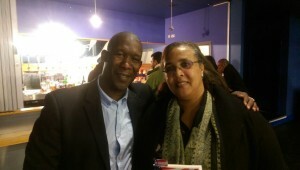 He was invited to South Wales to the prestigious Millennium Centre, Cardiff where he was part of the Black History Event Wales with Butetown Heritage Centre http://www.bhmwales.org.uk/ and discussed his book with the local public. He also spoke to young people at the Ask About Me Event at Bristol Royal Hotel on 24th October. 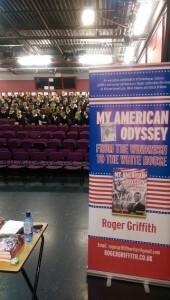 Roger also appeared at the Bristol Literary Festival on 17th October. Looking forward to next year and more events and festivals!